The victory in Singapore earned UP Diliman the distinction of being the only university to win the Global Final twice, recognizing the world-class talent of future finance professionals in the Philippines and the Asia-Pacific region. 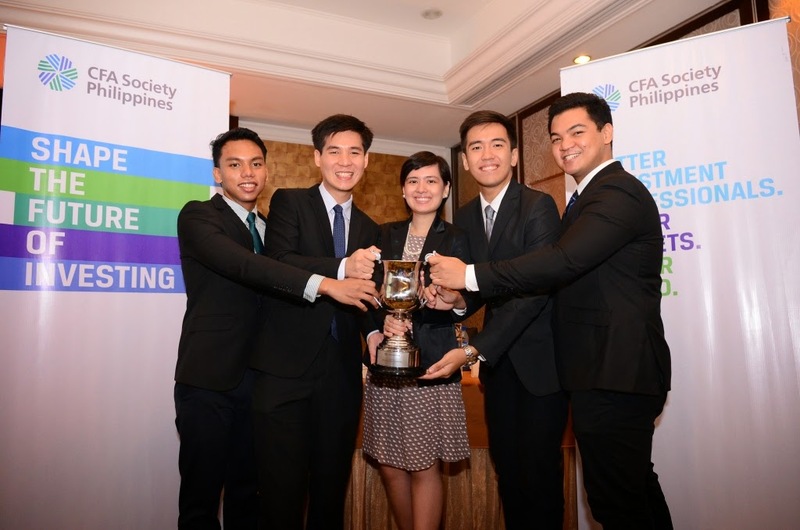 “The UP Diliman team has proven again to be solid representatives of the future of our industry,” says April Lynn Tan, CFA, president of CFA Society Philippines. CFA Institute, the global association of investment professionals, and its over 140 member societies worldwide including CFA Society Philippines, host local and regional Research Challenge competitions leading up to the Global Final, where the winning teams from the three regional finals compete. In 2013-2014, more than 3,700 students from over 800 universities around the world participated in the Research Challenge. The Research Challenge offers students the unique opportunity to learn applicable professional skills from leading industry experts and gain real-world experience as they assume the role of a research analyst. The UP team of Geoffrey Archangel Bautista, Diego Mikhail de Ocampo, Nigel Williamson Lee, Corrine Francesca Reyes, and Miguel Alfonso Solidum presented a buy recommendation on Meralco and defended their recommendation before an international panel of judges. Raymund Abara, CFA, of Vicsal Investment Inc. served as mentor, while Professor Daniel Vincent Borja served as faculty advisor. “We are very honored to share this achievement with the Philippine finance community. Our rigorous preparation every step of the way has helped us learn what it takes to excel in the finance profession. Financial skills are important, but so too is adherence to the highest ethical standards,” says Professor Daniel Vincent Borja. The CFA Institute Research Challenge is an annual educational initiative that promotes best practices in equity research through hands-on mentoring and intensive training in company analysis and presentation skills. Throughout the course of the competition, which requires hundreds of hours of preparation, participants receive mentoring from an industry professional as they analyze a publicly traded company, write a professional research report, and present their research results and recommendations to a high-profile panel of experts. Ethics and professional standards are at the core of the process and all participants are held to the CFA Institute Code of Ethics and Standards of Professional Conduct. Points are awarded to teams on the basis of their investment case, poise, and ability to answer the judges’ questions. The winning team is awarded a USD$10,000 grant for the university, and each team member receives a scholarship for the CFA Program.